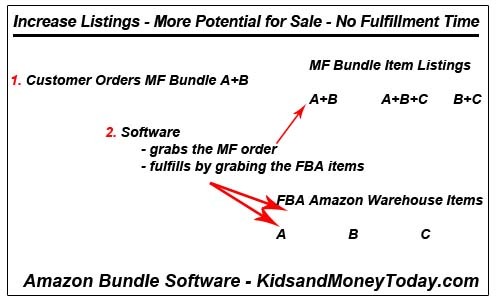 Learn about a ground-breaking Amazon Bundler software that allows sellers to take products you already offer using Fulfilled by Amazon (FBA) and connect these to fulfill your “virtual” Merchant Fulfilled (MF) bundle listings! Go into your Seller Central Account. Create a wide variety of mix and match combination bundles (a new ASIN consisting of different SKUs) from your FBA products. Also consider adding multi-packs as variations (the same product but a variance of size, quantity, or color). These show up beneath your existing listings, where the customer can immediately see them. Create items that will enhance the customer experience in accordance with Amazon Terms of Service (TOS). For example, if you have FBA listing A, B, and C, now you can add Merchant Fulfilled bundle listing A+B, bundle A+C, bundle A+B+C, and so on. Create as many variations as you like. *But…. now you may be thinking, I don’t want to be bagging multipack products together from my home! That’s not passive income. This brings us to Step 2. The bundler software is the connection between your MF and FBA listings. When the customer orders your MF Bundle A+B or a variation pack, the software connects the order to Amazon and uses AMAZON FBA items to complete the shipment. Amazon packages the box by grabbing from your FBA stock. The biggest benefit is the combination of time saved along with the opportunity to create numerous unique listings. The two factors are inter-linked, compliment each other, and grow exponentially. The more bundles created, the more time saved as orders begin shipping. It’s as if you have virtual FBA listings because your MF Bundles were never packaged together and never shipped to Amazon warehouse at all. Product bundling might be the smartest move to boost sales this year. You easily win the Buy box and save on Amazon warehouse storage fees! Watch this video clip to understand why before this software, many people avoided bundling. *Video is clipped to save you time. It’s only to show you the OLD way of bundling. With this software, you can choose to NEVER manually bundle again. At this time, the software will only work for Amazon.com uses (Amazon USA) but updates are in the works for Amazon.ca, Amazon.uk, Amazon.de and so forth. This is literally like having a virtual assistant working for you. Learn more about virtual listings from someone who ACTUALLY USES this! Private Facebook group available to answer questions. Tracy Foote Author | Writer | Entrepreneur | Internet Marketer "I'm enthusiastic about helping people in business and finance — so they can have money available for college, retirement, and travel."